We ask our users to immediately report any inappropriate behavior to the library staff. Staff will address the concerns immediately and call Madison College Public Safety or the Madison Police Department, as needed. Talking on cell phones. All mobile devices must be silenced prior to entering the library. Calls should be taken outside of the library. 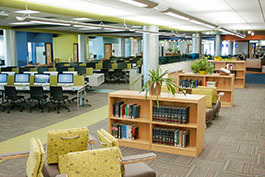 Having food or uncovered beverages when using library computers and/or equipment. Congregating in the library for discussion unrelated to school work and/or being disruptive to others. 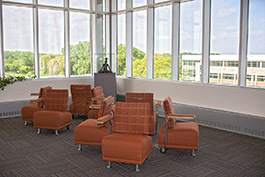 Groups of 5 or more are encouraged to reserve a Group Study Room or go to a more appropriate location on campus. Physically or verbally abusing library users or staff. Using tobacco products, alcohol, e-cigarettes or illegal drugs in the library. Damaging, defacing, or misusing library material and/or property. Leaving children under the age of 16 unaccompanied. The library accepts no liability or responsibility for the safety of unaccompanied children. Performing lewd or sexual acts in the library. Entering the library without proper attire (shirt, shoes, etc.). Failing to present appropriate ID when requested by staff. Distributing literature, pictures, etc. within the library without permission. Exhibiting any other behavior deemed inappropriate by library staff. 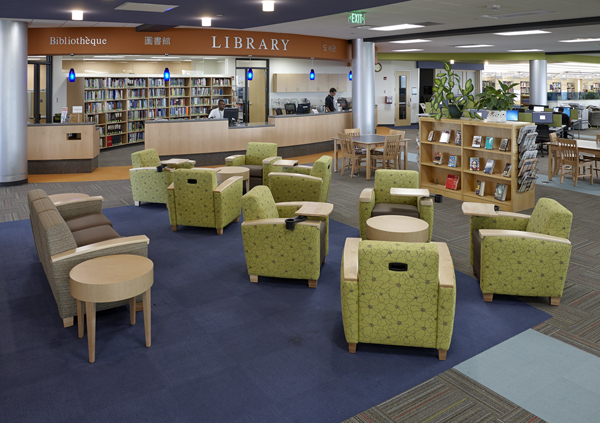 Patrons or patron groups found to be in violation of these rules will be given a warning and offered the choice of immediately discontinuing the behavior in question or voluntarily leaving the library. In the event that a patron refuses to either discontinue the behavior or leave the library, Madison College Public Safety will be contacted, and the patron will be identified and removed from the library. Failure to either comply with the library code of behavior or leave the library may also result in suspension of library privileges and expulsion from the library. Should a patron continue to exhibit inappropriate behavior on subsequent visits, he/she will be referred to library administration and/or Madison College conflict management staff for follow-up.